An update on Sen. Leticia Van de Putte and her decision about whether or not to run for Lite Gov. 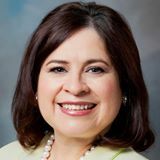 Van de Putte lost both an infant grandson, Rex, to unknown causes, in May, and her 82-year-old father, Daniel San Miguel Jr., in a car crash in June. Last Thursday, Davis’ father, Jerry Russell, 77, died from complications after abdominal surgery. Davis was by her father’s side the last weeks of his life, postponing any announcement about whether she would run for governor until later this month. “Well, we have visited a lot because we both lost our dads in a short period of time,” said Van de Putte, who said she had been in contact with Davis by phone during her hospital vigil. In her conversations with Davis, Van de Putte said they did not talk politics. My own sense is that Van de Putte would benefit Davis politically and emotionally if they ran together. Also, Van de Putte, with 14 years in the Senate and a career in the Hosue before that, is, unlike Davis, not up for reelection in 2014, so would not have to risk her seat to run statewide. And her story is a good one. See here for the background. I’m so on board with this. The two Senators would make an excellent and energizing top of the ticket, and should have no trouble attracting ballotmates, volunteer energy, and fundraising support. Sure, they would face an uphill battle, but they will be as well placed to start out as any Democratic statewide candidate has been in a long time. We’re ready when you are, ladies. BOR has more. Good post, Charles. I’m following the Texas Gov/Lt. Gov races closely from my perch in NYC. BTW — Please add a tweet button to your posts so we can easily send them to Twitter. Thanks. Hi, Jay. The AddThis button that is on the main page is now on individual pages like this one as well – see the “Share” icon underneath the Submit button for the comments. You can share with Facebook, Twitter, etc, with this. Thanks for pointing it out, I hadn’t realized it wasn’t on these pages as well. Okay, got it, Charles. You’re welcome! I’ll be tweeting your posts!